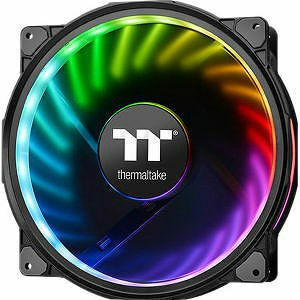 Specially made for those seeking a 200mm PWM fan with superior airflow, silent operation and customizable RGB lighting, Thermaltake Riing Plus 20 RGB features compression blades, hydraulic bearing, and a patented 16.8 million colors LED ring with 12 addressable LEDs sets (24 addressable LEDs). Supporting Thermaltake's patented TT RGB PLUS Software and AI interactive voice control, the Riing Plus 20 RGB lights up your system without sacrificing performance! TT RGB PLUS Ecosystem is the intelligent lighting system for PCs that combines the most advanced addressable LED lighting with Thermaltake's patented TT RGB PLUS Software. TT RGB PLUS ecosystem provides nearly unlimited possibilities for playing with colors, synchronizing lights to games, music, CPU temperatures or other TT RGB PLUS products, including case fans, CPU/VGA waterblocks, AIO CPU coolers, PSUs, LED strips and peripherals. The patented software allows users to change the light modes, colors, speeds, brightness, fan speeds, and even supports AI voice control in iOS and Android devices.